A bi-radial mainsail designed for the Itchenor division. Constructed using Contender Dacron fabric which complements the radial and cross cut layout perfectly. A bi-radial mainsail designed for the Falmouth division. Made out of Contender Dacron. Our very successful crosscut jib is available in two weights of cloth. The lighter cloth is the standard but the heavy cloth has proven to be particularly good in 12 knots plus and it offers a little more durability. 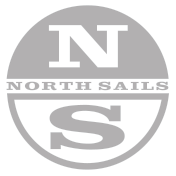 The North Sunbeam SS-12 spinnaker is an all round sail designed for the Itchenor fleet. It features a tri-radial construction, manufactured from Contender 0.75 oz. fabric.